Comet 17P/Holmes is Getting Bigger! I took the above images over a five day span to show how much it has grown in such a short amount of time, all at the same time every night and at the same magnification. 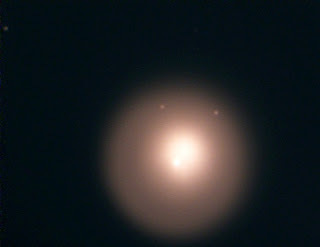 The Blogs and Message Boards are all abuzz with all kinds of theories and ideas about the expansion of this odd comet. One theory I never thought of is that someone had mentioned that this expansion and the Shuttle launch occurred around the same time and that the whereabouts of Bruce Willis at this time is unknown, I laughed til I stopped at that one. 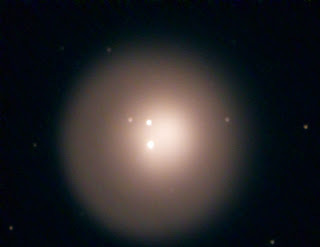 Comet Holmes is from what they call "Jupiter's family of comets". It is a short period comet and completes one orbit around Jupiter and the Sun every 7 years. Right now it is approximately 246 million kms. distant from the Earth, it had its closest approach to the Sun last May and will be its closest to Earth around November 7th. when it will be 243 million kms. distant, so no worries about it crashing into us, one of the theories why there is no tail is that we can't see it cause it's heading straight for us. Scientists don't really know why all of a sudden it got a million times brighter but they figured it happened once before back in 1892 allowing British astronomer Edwin Holmes to discover it. 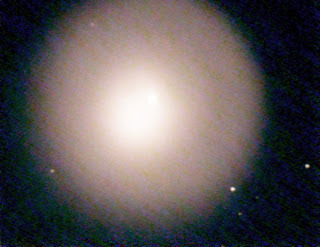 A comet has a honeycomb framework of solid particles enclosed in ice, one theory is that some of the comet's ice sublimated when it was closer to the Sun exposing a portion of it's core and just last week becoming unstable enough so that it's gravitational field could no longer hold it together and it broke up releasing massive amounts of dust, (which would account for the yellow/orange color), as well as releasing gases such as carbon monoxide. 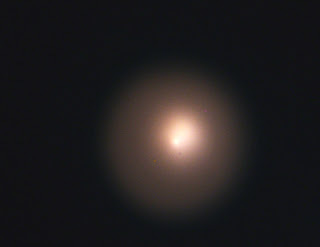 Where is this comet and how can you find it? The above picture shows you where to look. Go outside just as it is getting dark, look to the North East about half way up from the horizon, you will see a bright yellow star like object, that would be Holmes, it is just down and to the left of Mirfak in the constellation Perseus. No one is really quite sure how long it will be visible, could be 3 weeks or longer, right now it is still in the growing stage, may even grow a tail who knows. I'll leave you with a clip that a fellow amateur astronomer/astrophotography friend Tenho Tuomi made up of my images to give you a better idea the growth of this fascinating comet. Check out his website he lives outside of town and has some great astro images he has taken throughout the years. Just click on the image below and away you go. 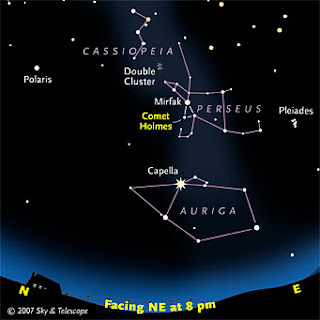 Edwin Holmes was doing some observing of the Andromeda Galaxy and discovered comet Holmes way back in 1892, you know the story, you find it, it gets named after you. Just last Tuesday it started getting very bright, like about 1 million times brighter! Scientists figure the only way it could have gotten that bright that fast is through a major out gassing and releasing major particles from its nucleus. 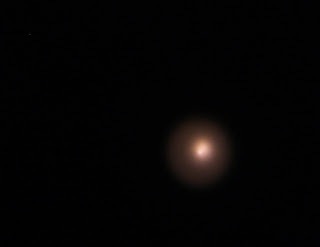 I took the image above last night, it is at 400x you can see it's pretty weird shaped for a comet, round and all, and the comet nucleus a star like appearance in the middle, you can make out it's tail pointing away from the Sun. It will be visible to the naked eye for at least the next week. You can spot it in the NE sky after it gets dark. It is just to the west of the star Mirfak in the constellation Perseus. It is quite easy to find, looks like an orange yellow star. 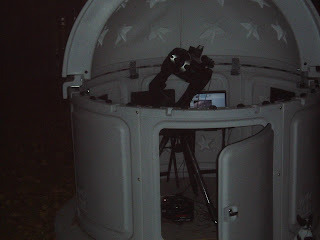 Check out Rick's Deep Sky Blog, he has an interesting post on the comet as well. I took a pic of my set up last night. 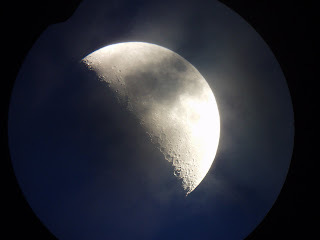 I had just taken some pics of the comet and was now taking some highly magnified images of Moon craters, in fact if you look at my sucky VISTA operated computer in the pod you can see the Moon being imaged. A real cool thing that happened to me, I submitted one of my photos of the comet to Sky and Telescope magazine's website, and it got chosen to be added to their photo section, not only in one of their regular categories, which is an honor in itself, but as an Editors Choice. Who knows for how long it will be there because they get billions of pictures everyday, and the Editors choice is for all the categories. I'm sure it will be around for a while in the Comet Holmes area. So far so good for the Shuttle Discovery. Successful launch and they are now docked with the ISS. They have mounted a camera on a special boom extension and attached it to their robot arm and used it to examine the Shuttle's underside for damage. Apparently a piece of foam from the external fuel tank fell off and hit the Shuttle during the ascent stage. The preliminary findings are good, no damage. I am watching NASA TV right now, they are into their first spacewalk, actually they just finished stowing a broken space station antenna in the Shuttle's payload bay, they are now preparing the Harmony Node for installation. Speaking of which the above pic is of the Harmony Node in the Shuttle's payload bay. Launch day for the Discovery. Still a chance the launch might be delayed due to incoming clouds but as of this writing they are fueling up the shuttle. Despite concerns raised by an independent safety group about cracks in the shuttles wing panels the launch will proceed at 11:38am EDT. NASA is saying "the defects are too small to allow hot gasses to burn through the composite carbon covers and destroy the spaceship during atmospheric re-entry". 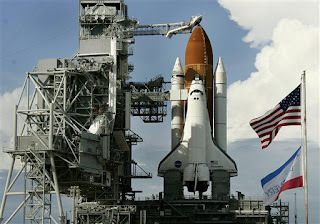 Shuttle Discovery's main mission is to install the Harmony module. They will also be testing new space shuttle heat shield repair methods, also moving a solar truss segment, this will be a huge job, or as they put it " like moving an entire house from one neighborhood to another. There are 5 planned spacewalks, the most ever during a shuttle flight, plenty of opportunity to catch them on NASA TV which is what I'm watching right now as I'm doing this post. T minus 3 hrs and holding, that's what the guy just said now on NASA TV, I will be watching the launch as well, remember cool TV camera angles during launch. The shuttle is planned for return on November 6th. 4:47 am EST. I love Earthshine! Moonlight is what we see when the Sun's light bounces off the Moon onto the Earth, Earthshine is what we see on the Moon when that same light is bounced back off Earth onto the Moon again. 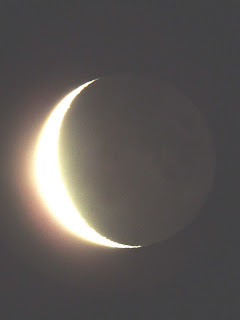 Earthshine is the faint glow on the dark portion of the crescent Moon. I took the above image during the last waning crescent. The Moon was low on the horizon so it got a nice yellow tint to it. 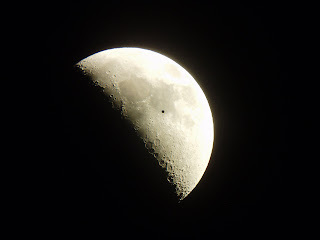 You can see because of the Earthshine some of the Lunar surface features on the dark portion of the Moon, like the dark Maria,(seas) Another cool thing is, look at the terminator, you can see the highlight of craters as it makes it's way across the Lunar surface. Leonardo Da Vinci first discovered what Earthshine was back around 1510, he said the ghostly glow was due to sunlight bouncing off Earth's oceans and , in turn hitting the Moon, well he was partly right, the reflected sunlight bouncing off the Earth's clouds is the major source of Earthshine. My name that puppy poll is now closed and it looks like drowseymonkey won, so unless me and drowseymonkey have some sort of falling out, which is kind of hard to do since we never had a falling in, don't even really know this person, (in fact I'm beginning to suspect drowseymonkey isn't her real name), I will be naming my puppy drowseymonkey. It will be a good conversation starter as I try to explain the name to friends and family, but deep down inside I know it's the right name. I'd like to take a moment to thank all of those who participated in the poll and to those of you who didn't, don't complain when I mention my dog's name drowseymonkey in my posts, you had your chance. Got a real cool shot of the Moon last night in its half Moon stage, the clouds were just right and gave a haunting mysterious look to the Moon, which is what the Moon is , haunting and mysterious. Interestingly enough the Moon had no color to it , couldn't saturate it at all, probably because of the fact there has been no solar activity lately. I marked off on the image below where Apollo 11 landed at the Mare Tranquillitatis or as we know it, The Sea Of Tranquility. July 20, 1969, Niel Armstrong was the first man to set foot onto the Lunar surface, below it is marked as a black circle on one of the images I took last night. 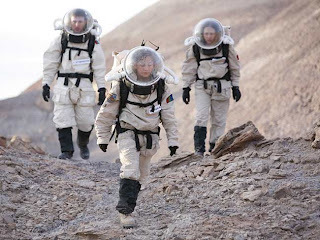 The Mars Society is now taking applications for mock Mars missions at their Mars Desert Research Station. Applications will be accepted from healthy people between the ages of 18-60, must be understood there will be hard work, no pay but eternal glory, all applicants must be willing to sign a liability waiver. The Mars Society has 4 mock Mars habitats, one in the Canadian Arctic, their Desert Research Station, one in the Australian outback and one in Iceland. They state, "In these Mars like environments, we will launch a program of extensive long duration geology and biology field exploration operations, conducted in the same style and under many of the same constraints as they would on the red planet. By doing so we will start the process of learning how to explore Mars". The Mars Society has many big sponsors including NASA. If I had the time and money I would so be there, want some of that eternal glory. Tycho Crater is my latest feature saturated color Lunar image, again lots of red, I'm running out of images that have any color in them, it was cool while it lasted. I've mentioned this fact before but I'll say it again cause it's cool. One of Tycho's rays intersected the Apollo 17's landing site over 2,000 kms away, the crew gathered a sample of the ejecta and the age of Tycho was determined by that sample, 108 million years old. 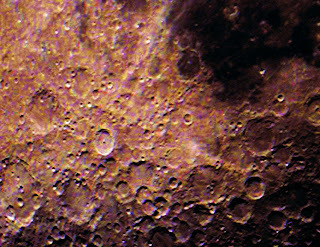 Tycho is the large crater just left of center with a central peak. You aliens can run but you can't hide! The Allen Radio Telescope is now online and has started gathering data last week with it's 42 radio dishes. 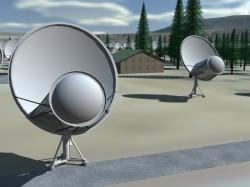 The array will eventually have 350 dishes and in the next couple decades will gather 1,000 times as much data as was gathered by SETI in the last 45 years. Paul Allen, co-founder of Microsoft contributed 25 million dollars, another group of investors has contributed 25 million dollars and UC Berkeley and SETI are fund raising additional funds to complete the project. They estimate completion with all 350 dishes in place in just 3 years. Below is a YouTube video of the array in action. 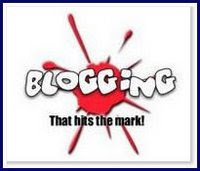 Drowseymonkey over at drowseymonkey has awarded me with the Blogging That Hits The Mark award, since it's not pink and it looks cool I accept. The best thing about this award is that it came from drowseymonkey, probably one of the best names for I blog I've run into, love to say it, so much so that when my cat passes on to where ever cats pass on to, I'm considering naming my new Boston Terrier drowseymonkey. What do you think? there is a poll at the side of my blog, the two choices are, 1 Boba, which is my gaming name, or 2. drowseymonkey. I know your probably thinking both pretty strange names, or as my wife said; "your not really going to name your dog Boba?, well maybe not now, how's drowseymonkey?, come here drowseymonkey, come here boy, or sit drowseymonkey sit, attack drowseymonkey attack! works for me. Besides having a cool name for a blog she also has some good funny stuff on her blog, and she also has a drowseypics photoblog with awesome pics. I would like to pass this award onto Anna over at My Only Photo great photos and she has a Story Blob with lots of cool stories on it. Anna is my astrophotographer and my eyes and ears down east, she is always fulfilling her assignments perfectly and on time, thanks Anna for all your hard work and great blogs. So far NASA is good to go on an October 23rd. Shuttle Discovery launch. There are however some concerns raised by an independent safety group about cracks in the wing panels. NASA is saying the cracks are small and won't be a problem stating "the defects are too small to allow hot gasses to burn through the composite covers and destroy the spaceship during atmospheric re-entry". 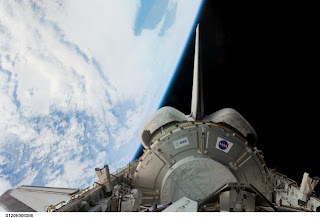 Shuttle Discovery's main mission is to install the Harmony Module at the ISS which will be the main connecting point between the U.S. destiny lab, the European Space Agency's Columbus Module and the Japanese Kibo module. Remember to watch NASA TV for this one, cool camera angles. NASA announced yesterday that it is officially extending the rovers Opportunity and Spirit's mission through to the end of 2009. The rovers landed on Mars January 2004, their mission was supposed to last only 90 days, they have beat all odds and numerous dust storms to have survived nearly 4 years on the surface of Mars. Between them they have sent back nearly 200,000 images and have made some amazing discoveries including the best evidence so far to date that water once flowed on the surface of Mars. Check out this video about what's really going on at Mars. 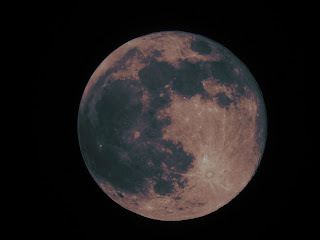 I'll leave you today with another one of my saturated lunar shots, this one was extremely saturated. I have a theory. Since Moonlight is reflected Sunlight which by the way is made up of 91% hydrogen, which is in the red spectrum and most of my pictures are pink and red, I'm thinking the type and amount of saturation is directly dependent on the solar activity when the image was taken, whether it be a solar flare, or Coronal Mass Ejections , what do you think? I'd thought I'd do something completely different with my Moon shots this time round and completely saturate them, it seems to be the latest fad. I have millions of Moons shots, some saturate a little, some a lot, some not at all. The above image was taken 10 days ago, the Lunar Terminator was framing 4 high profile lunar craters, thought it was a perfect photo op took advantage, took the pic. Plato Crater named after the famous Greek philosopher Plato is the dark crater situated top middle of the image. half in the shadow of the terminator. Copernicus is the light crater right of centre of the moon in this shot, named after the Polish astronomer Nicolaus Copernicus. Copernicus advanced the Heliocentric theory of the solar system where the Earth revolves around the Sun, not the other way around. Kepler is the crater just down and to the left of Copernicus, I like to call it paint ball crater because it looks like someone shot the Moon with a paintball gun. Kepler crater was named after Johannes Kepler, German astronomer and mathematician first to discover that planet orbit's are ellipses not circles. Finally Aristarchus is the small bright white crater up and to the left of paintball. Aristarchus was another Greek philosopher which among other amazing discoveries was the first to come up with the Heliocentric theory of the solar system over a thousand years before Copernicus. Well that's it, you now know the locations and names of 4 major lunar craters which will help you if they where to casually come up in conversation someday. All these craters have something special in common, they all have had a number of Lunar Transient Phenomenas or LTP's for short. 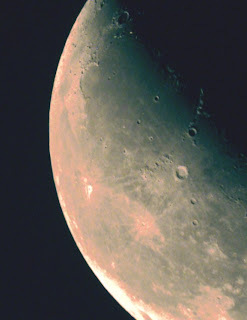 LTP's are any kind of short-lived activities or events seen on the Moon, over the years they have included red glows, flashes, obscuration and abnormal shadow effects. I belong to the LTP Research Program as an observer one of my duties is to observe the high repeat offending craters such as the ones above and report any unusual events using special report forms. There is a hot line number on their website I linked to above , write it down, you just never know when your going to spot an occurrence. The Japanese Space Agency's Lunar Orbiter Kaguya is now confirmed orbiting the Moon and has sent back a picture of the Lunar surface from 800 kms high. The picture was not taken with its Hi Def cameras so future images will increase in quality substantially when the cameras are set up and running later this month. When the pictures come through I will post them, they should be pretty awesome. 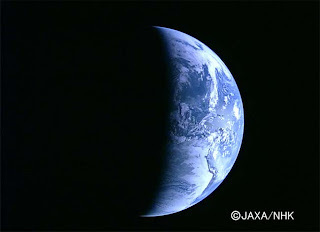 Kaguya's main mission is to understand the Moon's origin and evolution. 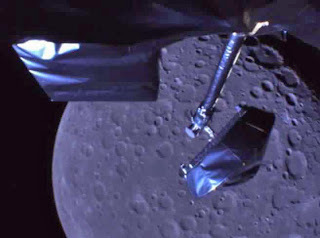 It is the most comprehensive lunar mission since the Apollo program. My 3rd. 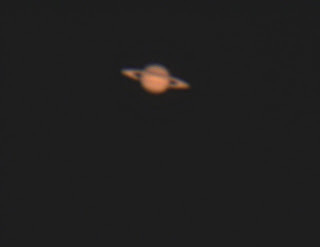 attempt ever of Saturn, getting bigger and a little more detail, still need it to get a little higher up in the sky and once it gets warmer I'll be able to use my electronic microfocuser, nearly impossible to manually adjust focus at 650x which is what the above Saturn is. 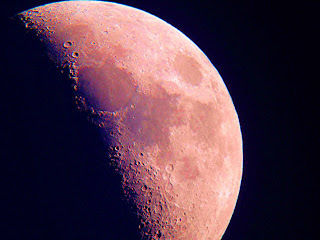 I'll leave you with one last color saturated Moon pic, enjoy. 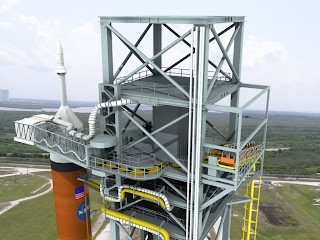 NASA has consulted with some of the world's finest Roller Coaster designers to come up with its new, as they put it "departure system" for its famous launch complex 39b. Apparently right now they have cables and a basket, but it is kind of hard sticking the wounded and incapacitated into the basket, with the new system just strap you and the wounded into the coaster cars and off you go, will get you to the bunker 380 feet below in just 4 minutes? wait that is like about 2 ft a second, that's not a roller coaster, more like a slower coaster, get it, slower, roller, rhymes, slower because of the slow speed........ never mind. I crawl faster than that, not that I crawl at all, but if I did it would be faster then 2 ft a second. You've just had a catastrophic event and you have wounded, you have deadly fumes and flames, by the way probably travelling faster then 2 feet a second towards you, my plan stick the wounded into the slower coaster car, and climb down the coaster framework, my calculations get me to the bunker and safety in about 1 minute. The above image is my first ever attempt at Mars. You can just make out the northern polar ice cap and some of the Syrtis Major region on it's surface. Geez people I'm loosing a lot of detail on my deep sky and planet images. The original TIFs are like 2 megs, when I go to photo shop to change to the jpeg format to download them to blogger I end up with 28k. 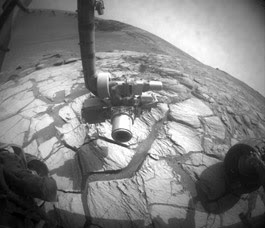 On my original Mars in the TIFF format you can actually see the alien guys doing re-construction on the nose part of the Face Of Mars, that is before the NSA confiscated them, something about national security. Mars , the 4th planet from our Sun is about half the size of Earth. Its orange hue is a result of iron oxide or as we know it "rust" making up a lot of the martian surface, which by the way has a very fine consistency, almost like talcum powder. Takes about 2 years to orbit the Sun and has seasons similar to Earth's. Temps vary from -140c in the winter to 20c in the summer. It's gravity is a little more than a third of Earth's, you weigh 150 lbs here, you'll weigh 56 lbs there. Mars has 2 moons, Phobes and Deimos, which by the way cause Mar's tilt for its seasons. Scientists with the help of Rovers Opportunity and Spirit are continuing their quest for water on Mars, because where there is water there is life. I have this real cool book, "Astronomy for Amateurs" published back in 1903 that gives a snapshot into what we held as true back then about life on Mars, I have actually blogged about this book in my post Martians And Venusians And Lunarians Oh My. The stuff in this book is wild, in reference to life on Mars, and I quote, "differing from our's, this world may well be a more congenial habitation. It's more ancient than the Earth, smaller, less massive. It has run more quickly through it's phases of its evolution. It's astral life is more advanced and it's humanity should be superior to our own, just as our successors a million years hence, for example, will be less coarse and barbarous than we are at present. There is no need to despair of entering someday into communication with these unknown beings". Little did we know back then that in 100 years the aliens would still be living in Caves. 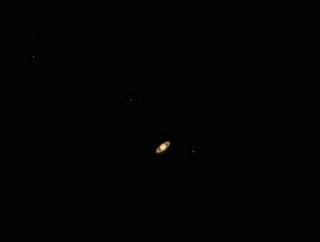 The above image of Saturn was taken a couple of mornings ago, Scope performed flawlessly, held the 450X Saturn dead center of the camera ccd chip while I was able to stack 60 images at .033 secs each. I tried to squeeze as much detail as possible out of Saturn, but being low on the horizon the atmosphere sucked the life and detail out of it. You can just make out a lower striped cloud band just below the rings, the upper band is partially obscured by the angled rings, I'll be posting more pics of the beautiful planet hopefully with more detail as I get more experienced and Saturn gets higher in the sky. In a couple of years we are going to loose those rings. Saturn is going to be at a viewing angle from Earth where the rings will be straight on, and since the average depth of the rings are only 1 km we won't be seeing much of them, so if your thinking of someday getting a telescope get one before the rings go bye bye. This of course is not permanent, they will come back over time, around 2 years after they disappear they slowly come back into view. Space Shuttle Discovery is traveling to launch pad 39a at Cape Canaveral in preparation for mission STS (space transportation system) 120. The crew's main mission is to deliver and install the Italian built for the US, Harmony module which will serve as a connecting point between the US destiny lab, the European Space Agency's Columbus module and the Japanese Kibo module. 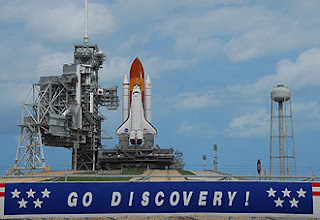 Discovery launch date is set for October 23, don't forget to watch NASA TV as they have some crazy angled camera shots which are always cool to watch. The rainbow in the above pic is caused by a water truck which sprays water ahead of the crawler-keeps the crawlerway moist and the dust down. The crawler, shuttle combined weight is 175 million pounds, moving at a rate of 1 mph. Mars Rover Opportunity has gone into Victoria Crater at Duck Bay point. 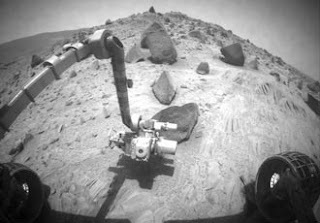 The image above shows opportunity in front of a band of what scientists think and I quote "Is the ancient surface of Mars prior to the impact that created Victoria". By sampling it at several different levels in the crater they are hoping to figure out the processes that led to its formation and its very distinctive appearance. 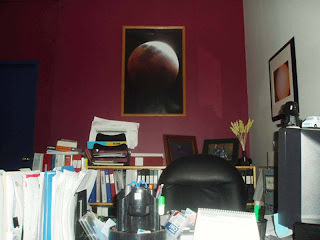 The pic above is one of my Total Lunar Eclipse photos blown up to 24"x36" and hung in my office, I'm happy it turned out so well, cool. Okay people we have a lot to cover today so lets get started, not really but I've always wanted to say that. My power engineering teacher said that a few nights back, I thought at my age I'd never hear those dreaded words again, you know your teacher would rush in to the class with a bunch of books under their arm and say those words and you'd be thinking crap, brain already full. 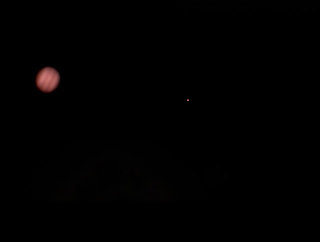 The image above is my first attempt at Jupiter taken last year. You can see Europa off to the right. Jupiter is the 5th. planet from the Sun, takes 11 years to orbit the Sun and has 63 confirmed moons. Jupiter is our largest planet, has 2.5 times the mass as all the other planets combined, Jupiter is made up mostly of gases with a rocky core. 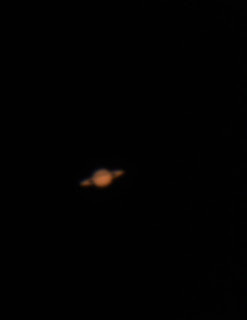 The image below is my first attempt at Saturn taken last year as well. That is exactly what you'd see looking through an amateur telescope, beautiful. Saturn is the only planet that would float in water because it is made up of gases, no rocky core. It is the 6th. planet out from our Sun and takes around 29 years to complete one orbit. Saturn has 60 confirmed moons. In the image you can see 3 of Saturn's moons, starting from the closest moon from Saturn going out they are, Dione , Titan , Iapetus. I will post updates when I take more images with newer better equipment when the weather allows, looks like April, we have a long cold winter here and it seems to be starting early. The Mars Odyssey Spacecraft acouple weeks back had discovered entrances to several possible caves on the slopes of a Martian volcano Arsia Mons, below is a close up of one of the caves, now they are saying and I quote, "Martian Caves are interesting not only for their geology but as possible habitats for future human colonists" I posted a picture below of the cave and of the habitat that was in the film Race To Mars , where would you want to live? 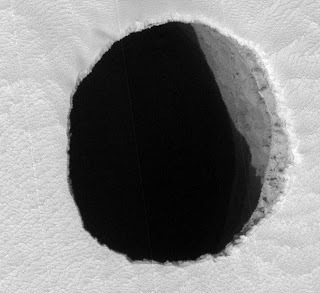 The hole looks deep and dark, probably where the aliens are hiding, where as the habitat doesn't have aliens or things that bite, oh and has a big screen TV, probably High Definition, I vote the habitat. I can see it all now, NASA sends a group of terraformer Scientists with hoes and rakes, and first aid kits with flare guns, not a real gun between them, one of them goes to investigate the caves by themselves, doesn't come back, another scientist without a gun goes to look for the first one, that one doesn't come back, you get my drift, the aliens pick them off one by one. Scientists need to watch more scary sci fi shows. The Japanese satellite Kaguya on its way to the Moon has taken the first High Definition video of Earth from beyond it's orbit, 68,350 miles to be exact. The video has not been released yet but a still image (below) has, you can see the western coast of South America in the image. I'm looking forward to more High Def stuff from this satellite.